Jim has been a member of the CC&GTCC, Inc., for 18 years and was made a Life Member (#53) as a gift from his wife of 39 years, Pam Focazio, in his first year of eligibility. 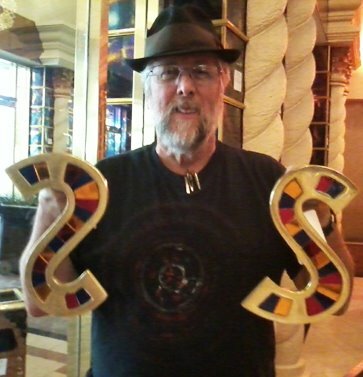 Jim uses the moniker �Gaming Ore� in his search for gaming and casino memorabilia. Gaming Ore has a website, TheChipGallery.com where one can find the Great Sahara Plaque Registry, The Top 10�s to 100 Project and a gallery of WIN CARDS Program chips, flyers and cards. As a volunteer to the Club, Jim has been the OTY Awards Chairman since 2002, during which he established the Permanent Collection of All Past OTY Winners. He is currently the MoGH�s Exhibit Chairman and in both of these positions he is assisted by his son Casey Focazio-Follis. In addition to those annual Convention-related duties, he is the Club�s co-Club Historian, along with Club Hall of Famer, Carey Burke, and he serves on the Southern Nevada Casino Collectibles Club Board as the Secretary. Jim is retired from a 35 year career in aerospace as a Security Manager and lives in Las Vegas, Nevada, the center of the casino collectibles universe. Living in Las Vegas has allowed him to support the MoGH as the El Cortez and Plaza Exhibits Manager.